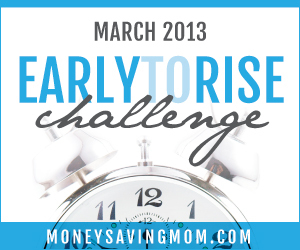 This is Day 24 of the Money Saving Mom Early to Rise Challenge! I highlighted a lot in today's passage. 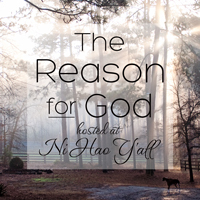 It covers how you can have a "creator" life vs. a "reactive" life. Basically, are you doing something or are you waiting for something? This fits in perfectly with a subject I heard spoken at a conference I attended last Friday. Our church hosted Jill Savage and she spoke on friendship. It was a message I so needed to hear and it hit home with me. I think on what she said daily, and this applies perfectly too. Am I a reactor or a creator? Am I a "here I am" or a "there you are" kind of person? I hate to elaborate much more as I really do want you to read the author's words in the book. I think you'll be blessed by them just as I am. So, what time did I wake up today? Right at 5 am when Fredrika did her thing. Yay! I do really enjoy this time when it's so quiet in the house and now feel my day just didn't start right if I don't get in my morning quiet time. What kind of person are you going to choose to be? A reactor or a creator?